"Not once during the time that the White House Plumbers were in business did we ask the ethical question: Is this right?" Part of Aristotle's famous definition of a tragic hero was that of a king or leader, who through an innate fault or mistake, destroys himself. There are few 20th century figures that fit that definition quite as well as Richard Nixon, whose bitterness and paranoia resulted in sowing the seeds of his own destruction, first by authorizing illegal activity due to paranoia over his enemies, and setting up his notorious taping system, installed because of a paranoia over his friends. This History Channel documentary gives a once-over of Nixon's legacy and takes a tentative peek into the dark corners of his psyche. The story begins with Nixon's famous Checkers speech, which saved his nomination for vice president in 1952 when Eisenhower was considering his elimination from the ticket. The story skips forward to his ill-fated runs for the presidency in 1960 and California's governship in 1962, and his retreat into the wilderness for a few years. Things get interesting as he stages his 1968 comeback against the background of unrest over Vietnam, first portraying himself as someone who would end the war, but then escalating it far beyond Congressional authorizations and criminal invasions of neighboring countries. The documentary doesn't manage to uncover whether this difference was pure hypocrisy, or whether he had a sincere change of views, though the presentation of Nixon as the consummate political manipulator certainly suggests an answer. 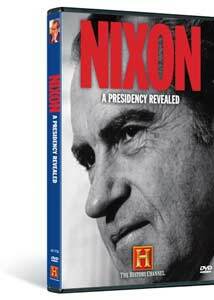 The documentary really starts into motion as Nixon's mental issues moved into the forefront. Increasingly distrustful, a trait encouraged by John Ehrlichman and H.R. Haldeman, who isolated him from reality and kept him in a bubble that prevented reality from intruding into his growingly dark perspective on his fellow Americans. This was expressed in a suspicion that the antiwar movement was led by foreign agitators, resulting in wiretapping of not only journalists and activists, but also members of Kissinger's staff and his on administration, believing that they were leaking information in order to destroy him. These fears reach their head in the Huston Plan, which by intrusive snooping into private lives was considered horrifying 35 years ago, but is business as usual under the so-called PATRIOT Act today. One particularly revealing segment features tape of Nixon ranting against his own Cabinet after they failed to properly appreciate a speech against defeatism in Vietnam. On the other hand, Nixon is given plenty of credit for his foreign policy successes, such as his momentous visit to China, which completely changed the world order in ways that are still being felt today, as well as arms-control treaties with the Soviet Union. Could only Nixon go to China and make peaceful overtures to the USSR? Perhaps, but how much of that atmosphere was of his own creation? His other often-unappreciated policies, such as encouraging methadone treatment rather than imprisonment for drug addicts, are covered as well. As Robert Dole wryly notes, Nixon would be considered far too liberal to be a Republican candidate today, a notion that certainly would have been shocking in 1972. The documentary features the usual assortment of talking heads, interspersed with period footage largely faded to pink or grey. While there are plenty of intriguing tidbits to be had here even for those familiar with the Nixon presidency and the Watergate scandal (including some of the notorious White House tapes), but his character remains largely impenetrable. He was capable of monstrous things, but he also could wander alone out of the White House to the Lincoln Memorial to talk to antiwar protesters in the middle of the night. Full of contradictions, Nixon remains a fascinating character who still has his devoted supporters, such as Plumber Egil Krogh and the aged Henry Kissinger and others deeply involved in the President's criminal conduct. The main distinction is that even Nixon had enough of a conscience to see eventually that he had no choice other than to resign in disgrace. Image Transfer Review: The modern footage looks excellent. On the other hand, the vintage film and video suffers from frequent aliasing, making it appear that these segments of the documentary are improperly flagged. The modern segments are still crisp and clean, with good color. There are natural shortcomings to the older material. Other than the aliasing issue, it's quite a satisfactory presentation. Audio Transfer Review: The audio is unsurprisingly center-oriented most of the time. The quiet musical score is the only use made of the surrounds. It's quite clean, without notable hiss (again, subject to the shortcomings of the older source materials). There's nothing to complain about, but nothing flashy either. Extras Review: The sole extra is a terrific one: an episode of Inside the Presidency, hosted by Roger Mudd, entitled Eisenhower vs. Nixon (45m:41s). This fascinating documentary looks at the difficult relationship between the genial and grandfatherly war hero, and the angry, red-baiting and ambitious young politician. With vintage footage and recollections from various principals, a vivid picture is painted of their ill-at-ease working relationship. It also makes clear that this was the beginning of the imperial vice-presidency, imbued with powers unimagined by former veeps who characterized the post as "not worth a bucket of warm spit." Even the apologetic presence of right-wing mouthpieces such as Monica Crowley and David Broder can't get in the way of the fascinating presentation, with its numerous intriguing anecdotes that shed light on Nixon's later conduct. Most striking is the story of Nixon's mad scramble to find a copy of the Constitution after Eisenhower's first heart attack, in order to figure out what to do. There's also a tidbit that clears up the enduring mystery of why Eisenhower failed to campaign for Nixon in the waning days of the 1960 election, in hindsight ensuring Kennedy's presidency. The closer examination of a less-well-documented period of Nixon's life is certainly worthwhile and helps shine a light on his later years in office. The principal feature tries, but can't quite explain Nixon the man; the bonus feature does a far better job of penetrating his character. Together, they form a very good portrait of the 37th president.